1. Tour de Ren kicks off on Friday, April 26, from 3:00 pm – 5:00 pm to raise money for the patients at Phoenix Children’s Hospital. This high-energy outdoor spin cycle event is being held at Renaissance Square, located at Central and Washington in downtown Phoenix, and generously hosted by Oaktree Capital Management, Cypress Office Properties, Hines and Lee & Associates. 2. CoStar Group, Inc., the data/analytics leader of the commercial real estate industry, just announced this year’s Power Broker Award recipients, recognizing professionals and firms who closed the highest transaction volume in commercial real estate deals and leads in their respective markets. 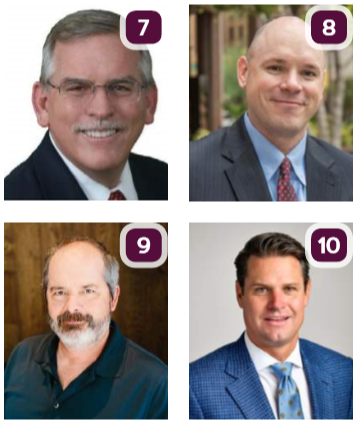 C&W | PICOR team members comprised at least two of the top five in each category, including office leasing, retail leasing, industrial leasing and sales. The full list of winners can be found here. 3. Audra Koester Thomas transportation planning program manager for the Maricopa Association of Governments, was recognized as the WTS Phoenix Chapter’s Woman of the Year during a ceremony at the Elite Hangar in Scottsdale on March 23. 4. Chicanos Por La Causa is celebrating their 50th Anniversary with a dinner and awards ceremony called “Here We Stand,” on Saturday, April 7th at 6:00 p.m., at the Phoenix Convention Center. At the ceremony, CPLC will honor individuals who are trailblazers that have broken barriers in sports, music and philanthropy. 5. Aeroseal America, which has provided a patented technology to seal duct work for residential clients for 3 years, has launched a commercial component to service a new line of clientele that will provide testing and sealing of ductwork for HVAC systems in light commercial properties. 6. Jessica Sarkissian, AICP has opened UPFRONT Planning & Entitlements, LLC in Mesa, AZ. UPFRONT Planning is a private consulting firm that provides land planning and entitlements services, public outreach, due diligence, code writing and project coordination to both public and private sector clients. 7. Hunter Contracting Co. announced that Chuck English, who has been with the heavy site/civil construction company for more than 33 years, has been promoted to President. English will oversee Hunter’s day-to-day operations focusing on planning for success, aligning Hunter’s resources with project requirements, and developing future business opportunities. 8. Lee & Associates Arizona is pleased to announce the promotion of Gregg Kafka, CCIM to Principal as part of The Coppola-Cheney Group, a leading office brokerage team within the firm. 9. Achen-Gardner Construction has announced the promotion of Aric Smith to the position of project manager. Aric brings almost 30 years of experience in pipeline construction and rehabilitation, large water main shutdowns and startups, large main dewatering, and complex shoring design and installation. 10. Lee & Associates Arizona announced the addition of Matt Nebeker as its newest Principal specializing in East Valley office leasing.